Don't put that Nativity Scene away just yet! Tomorrow, January 6th, is the Day of the Kings (or may know it by the name, The Epiphany), and is widely celebrated throughout Latin America. The Christmas Traditions of Mexico continue through today by celebrating the day when the 3 Wise Men arrived at the manger with their precious gifts. Families will add the wise men to their Nativity Scene and host a dinner party, typically serving tamales, hot chocolate, and a Rosca de Reyes for dessert. 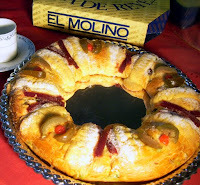 The Rosca de Reyes is a round or oval shaped bread topped and filled with candied fruit. This bread contains a hidden plastic baby Jesus doll. When the bread is served, the lucky guest with the baby Jesus in their piece then hosts the next party on February 2, Calendaria , and also buys the baby Jesus new clothes for next year's Nativity. At nightfall, a little bit of magic begins...The children of Mexico will have written out a small wish list (think Santa list) for the Kings several days prior to the 6th. Many send their letter up to the Kings via helium balloon. They may also leave out a bit of hay, water, and food for the Kings and their camels to fill up on before continuing on their journey. Then, they go to bed and leave out their shoes for the Kings to fill with goodies! So, seek out any bakery today and get your Rosca. Invite over friends and neighbors to enjoy hot chocolate and dessert! Yum!!! Provecho!!! !